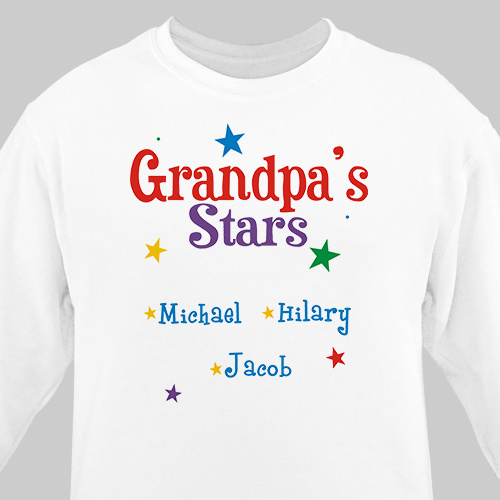 Grandpa's Personalized Sweatshirts will twinkle with all of his Little Stars on display. He will be looking bright and cheery when he wears this handsome personalized shirt. Our My Stars Customizable Sweatshirts for Dad or Grandpa is available on our premium white cotton/poly blend Sweatshirt, machine washable in adult sizes S-3XL. Personalized Sweatshirt is also available in Ash Gray. It was a gift and was very well liked. GiftsForyouNow offers lots of shirts that are perfect for Father's Day. In addition to our Personalized Father's Day shirts, we offer personalized Fathers day Frames, Personalized Polos & Personalized Fathers Day Keepsakes. Shop today!